Despite the fact that my scheduled posts in the month of October made it look like we were up to something, the only project that has been going on in these parts for the last month is adapting to life with Leo. 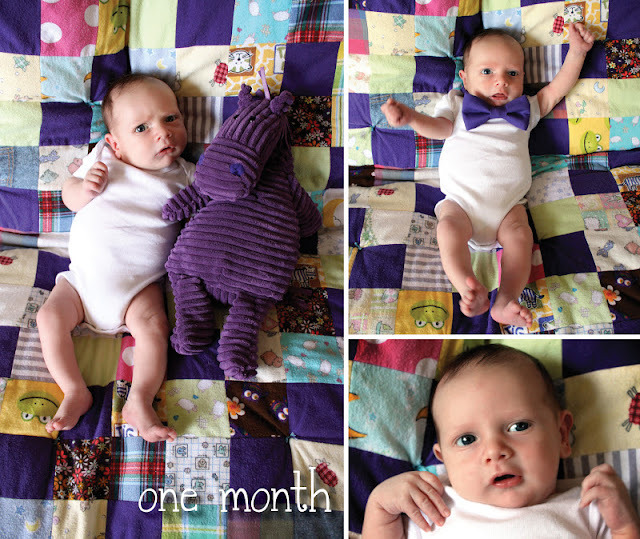 He's an amazing little man, and we're getting used to our new way of life, revolving entirely around him of course. He pretty much does what he's supposed to, eats, sleeps and poops. He loves his swing, walks in the stroller, and does great in the car — he even survived his first trip to Granny's without needing to get out of the car seat for the entire three hours! My mom calls him a magic baby. I would have to agree. He's up over 2 pounds from his hospital low, weighing in at 10 lbs. 10 oz. most recently. We're just starting to get an unprompted, non-gas related smile or two, and some coos that sound different than his initial squawks and grunts. He seems to have amazing head strength already, and when he's awake, he's incredibly alert. We can't wait to see what the next month brings! Now that the deck was operational, it was time to focus on enclosing the shed structure underneath so that we could reclaim the garage for my car before Luigi arrived. There is still some finish trim work to do on the deck itself, as well as staining the decking itself. But, we decided these things could wait in favor of garage space. The first step on the enclosure was to finish create another masonry wall along one side of the shed where the ground will slope down from the patio to the back yard. It took a few days of work for Greg to finish. Above, you can see the finished masonry wall with the stud framing in place. Below, you can see Greg and a few coworkers building that portion of framing. It's kind of a funny story how they came to help on a Saturday in mid-July. Every summer, Greg's company has a charity fund raiser, which involves a silent auction where various employees donate prizes. Some are as elaborate as a week in a time share, or a plane ride. This year, there was a group of people who got together to volunteer one day of handymen time to help finish projects around the house. Needless to say, Greg was determined to win this prize, and basically stuffed the box with $40 worth of raffle tickets. $40 for 4 people to help with house projects for a day sounds like an awesome deal to me. As it turned out, we weren't able to schedule all 4 of the at once, which actually worked to our benefit. We were able to spread some of the projects around. On this particular day, Reem and Mike were over, and not only did the help Greg with this wall, but they also painted Luigi's nursery and a bunch of trim in our stairwell! The shed continued to progress through the rest of July and August, and Greg started stashing stuff in there before it was fully enclosed. Casey and Dan, the other two of Greg's coworker/handymen came on a Saturday in August, and not only did they load the dumpster of all the constuction debris, they helped to finish all the walls and built the three doors that provide access into the shed. It looks like a great place to store stuff, doesn't it? We were now halfway into the month of June, and though we could use our deck, we still had no way to get down from it. I certainly wasn't planning to jump in my condition! The race was on, as we committed to hosting Greg's family for the 4th of July, and Gina's 65th birthday party. But, before the stairs could even go on, Greg had to start on one of the walls to enclose the shed, that would be too difficult to take on after. It involved a masonry partition with wood framing above. Once the wall was complete, it was time for the stringers to go in. Originally, we thought it would save time to buy precut stringers. But, as it turned out, the ratio of tread to riser was not quite the 11"/7" standard we had used in our plans. This meant that the store bought, pre-cut stringer was not going to land on the sonotube we already had imbedded in the ground for the foundation. It was also made out of a 2x 10 instead of a 2x12, which of course, did not satisfy Greg from a structural standpoint. So, he ended up cutting his own. For the risers, we again opted for a white PVC trim product to keep maintenance down. It took more bags of concrete that I care to remember to fill that hole. As previously mentioned, Greg was up against a party deadline, so he was at it every night that the weather allowed, until the sun left for the day, approaching 9:00 pm. Below, he's painting the tops of the stringers before putting the treads on to help protect them from any water that might sit on that edge. Finally, it was time for the treads to go on! And last, but not least, the railing. This was another complicated installation. The prefab PVC railings did not come in the right segment length for our spacing, which meant that Greg had to adjust a regular railing kit to make it work. He had to individually modify each of the plastic balusters to create the correct angle. I think it's safe to sat he did an excellent job! And just like that, in right under the wire, the deck was suitable for entertaining! Being able to walk out on the deck was a nice benefit of course, but it would be nice not to have to worry about getting too close to the edge. Which meant, of course, that it was time for railings. For various reasons, many of which were budgetary, we elected to use pressure treated wood for the decking. There were some really great PVC products that we liked the look and idea of for the low maintenance aspects, but the fact that they were more than triple pressure treated wood, and that we ultimately can imagine turning this deck into a screened room someday, meaning we'd be covering over the decking anyway, meant that the PVC just didn't make sense. With the railing on the other hand...well, the cost premium wasn't that much more. We always liked the idea of a white railing, but not the idea of maintaining it, having to paint all of those balusters over and over. So, this is where we opted for a PVC product. Above, you can see the sleeves that slide down over the wood posts that are secured to the deck framing. Each one had a giant sticker label, which of course, was not of the easily removable kind. My job was to scrape off all the labels, which took a combination of a plastic scraper, goo gone, and fantastic to actually get rid of all of the residue. While I took on that task, Greg investigated how the system snapped together to figure out his plan of attack and to make sure he was satisfied from the stand point of a structural engineer. He also managed to make a great mess of the kitchen and dining room will all of the parts and pieces and tools that were required for this portion of the work. Since the deck didn't have stairs yet, he swore it was easier for him to do all of this in the house on the level of the deck. You can imagine that I was a little less than thrilled with the sliding compound mitre saw living on the floor of the dining room for a week! Such is the life of a DIYer I guess, right? I eventually convinced him to leave that set up in the garage. The railings went up a few sections at a time, and we were extremely pleased with the result. We were also final able to start really enjoying the deck with our little table for two. The last weekend in May, the deck really came together, and actually began to look like a deck. George was on hand to help for the afternoon to get all of the boards screwed into place. Here, you can also start to imagine what the storage shed under the deck would end up looking like. Continuing along with our tour through the progress we've made on the house in the first two years, which very well may take until we've lived here for three years to complete, here's a look at our office/guest room. 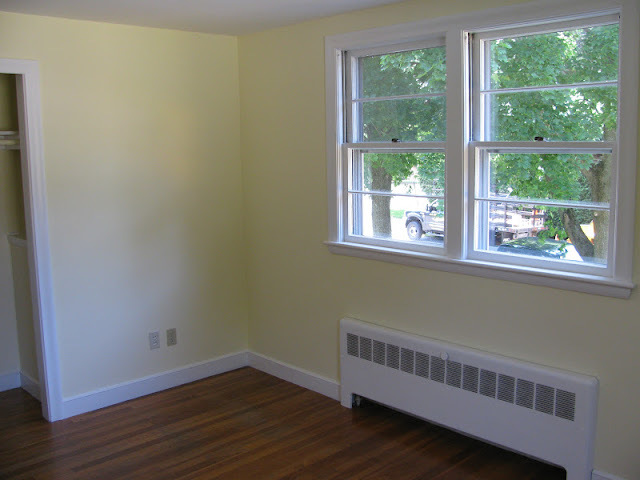 It's a very bright, sunny room with the nice double window that looks out over the front yard. That's one reason why we chose it for the office instead of the nursery, thinking that the room in the back corner would ultimately be better for nap time. And since this room now needs to serve double duty as our office and space for guests, it's nice that it's the bigger of the two other bedrooms in the house. As you can see, when we moved in, this room was that lovely pale yellow, just like every. other. room. in the entire house! Here's what it looked like after we added our new desks last fall, but before we got rid of the yellow. The light wood looked lost against that awful color. But it pops nicely against the bright, cheery green we chose. Here's a reminder of the old hand-me-down tables we were using as desks before we got the new ones. And another angle of the Ikea solution that replaced them. This is what it looked like before we managed to fill the open shelves up with stuff. Here's the other window in the room that looks out toward the side yard of the house. We had quite a conglomeration of metal storage shelves, and big clunky and rusty file cabinet, all of which drove me a bit crazy with their mismatched feeling. After we installed the first batch of new furniture from Ikea, which included file cabinet and new white shelf under the window, we still used the old metal shelves while we waited to sort out what the closed storage solution on the wall was going to be. 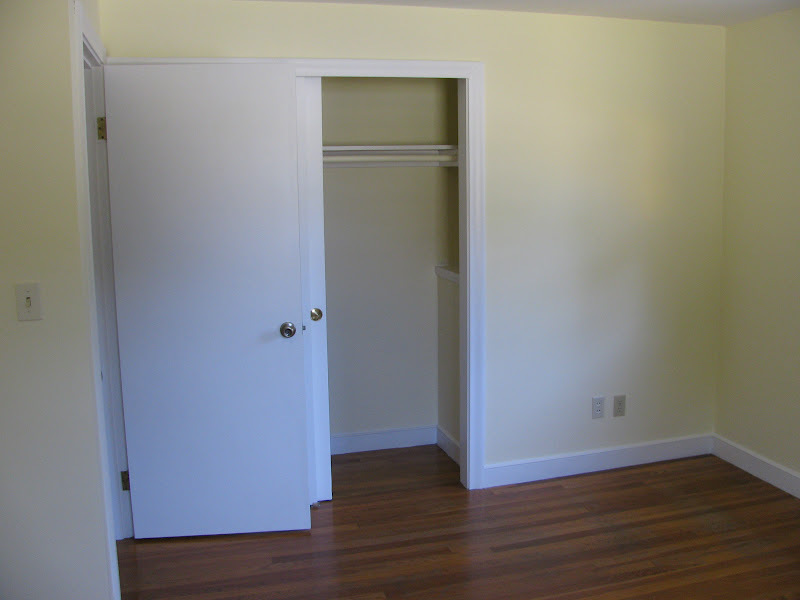 You can see from this photo that this room serves a lot of purposes, and really needed some help! Here's the current solution, with the overhead storage cabinets now containing most of the crafty stuff, and giving us some more open storage above (which admittedly, still needs attention!) We were able to design a solution that fit perfectly around my old couch, which had been living in my mom's basement since I moved in with Greg six years ago. The couch blocks some of the shelves in the corner, but we're using those to mostly store the linens and pillows for guests. The back cushions come off the couch very easily to allow access to those shelves, and to turn the couch into a twin sized bed. In addition to that, the top cushion can fold forward onto the floor creating a queen sized mattress on the floor. It turned out to be a perfect solution for a flexible office guest room. And, since I don't have any now shots of the closet wall, here's a reminder of what that looks like. You can see from the first photo that there is some wall space to the right of the closet. You can get the slightest glimpse of a ledge inside the closet, behind that wall. Because our house is a split level, that ledge is actually the ceiling of the coat closet half a level down by the front door. It drives us a little bit crazy that there is a whole bunch of storage space, just waiting to be utilized. We have talked about opening up that wall, above the height of the ledge to create an open shelving solution of some sort, perhaps to house the TV and the printer which now live on metal shelves in front of that space. Who knows when we'll get there though. Real window treatments, to replace that paper ones that are still up, and badly needed for privacy. We'll probably go with wood blinds like the ones in the master, but in in white instead.